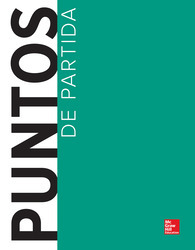 Supplementary Materials to accompany Puntos de partida is comprised of worksheets and a teacher's guide. These two supplements are a compilation of materials that include short pronunciation practice, listening exercises, grammar worksheets, integrative communication-building activities, comprehensive chapter reviews, and language games. Sharon Wilson Foerster retired from the University of Texas at Austin in 2001, where she had been the Coordinator of Lower-Division Courses in the Department of Spanish and Portuguese, directing the first- and second-year Spanish language program and training graduate assistant instructors. She continues to teach in the Spanish Summer Language School at Middlebury College in Vermont. She received her Ph.D. in Intercultural Communications from the University of Texas in 1981. Before joining the faculty at the University of Texas, she was Director of the Center for Cross-Cultural Study in Seville, Spain, for four years. She continues her involvement in study abroad through her work as Director of the Spanish Teaching Institute and as Academic Advisor for Academic Programs International. She is the co-author of the following McGraw-Hill titles: Pasaporte: Spanish for High Beginners (2009); Supplementary Materials to accompany Puntos de partida, Eighth Edition (2009); Metas: Spanish in Review, Moving Toward Fluency (2008); Punto y aparte: Spanish in Review, Moving Toward Fluency, Third Edition (2007); Lecturas literarias: Moving Toward Linguistic and Cultural Fluency Through Literature (2007); Metas comunicativas para maestros (1999); and Metas comunicativas para negocios (1998).